Was in Hong Kong last Saturday night to meet up with Cakie only for her to zhun zhun pick the weekend Typhoon Neoguri was coming to town. As I was looking the tropical cyclone tracking website, I calculated that we would feel the full impact of the typhoon shortly after midnight and so I made the call to go ahead to travel down to Hong Kong that Saturday afternoon. 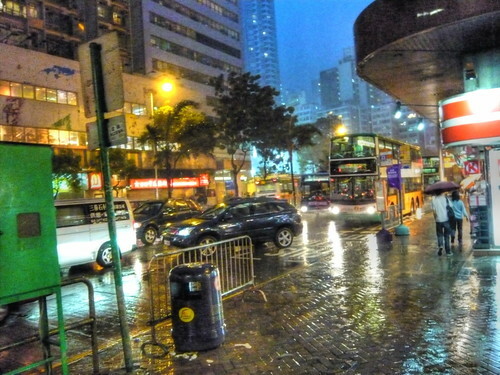 It was raining heavily when I got to WanChai but the wind was weaker than I expected which I later found out that the typhoon has already subsided by the time it reached Hong Kong. Hence, the rather subdued photo above. One would have hoped to see trees bent and snapped by the howling gales, people flying in the air with cars flipping over and tumbling down the streets. How about tsunami crests crashing against the buildings of the Hong Kong skyline? Sorry, no such luck as all mother nature did was a heck of a weak bl0wjob. Still, it was enough to screw up all the flights over the weekend. From historical data, the average of a first typhoon of each year is calculated to be 24th of June and this Neoguri was two months ahead of schedule, a record earliest in 60 years. Reports predicted that this could be a year of a higher number of typhoon strikes and of greater intensity. Good luck with that. And yeah, I got myself soaked by the stupid rain but the company made up for everything as we had a pretty fun evening with excellent food and vodka. I remember the typhoon on Sat. Was bummed that the typhoon didn't come earlier on Friday or later on Monday. We stayed at home the whole day. Was too afraid that if we went out, there might be a slight chance that we might not be able to make it home. The ferries might be down or the Tsingma Bridge might be shut. Faith Sim: I was bummed coz I expected something stronger. Turned out to be so weak.